March Madness! 2 Days Only! Save 25% up to $1,000,000! If you’re a college basketball fan, this is the month you look forward to every year. The OurChurch.Com team wants to make March something for everyone to look forward to. Right now… Save 25% on all hosting services! OK, so you’re probably not going to bump into that $1,000,000 limit. We just like saying, “One Million Dollars” (a la Austin Powers) and want you to save big on web hosting. Sale ends 11:59 PM Eastern Friday March 4. Discount is for upgrades and new accounts only. 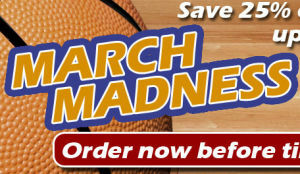 …we’re going to do another 2 Day March Madness sale. This week it’s hosting, but in future weeks we’ll have sales on custom design services, search marketing services, advertising, and one super secret sale at the end of the month. So, if you want a great new site, top search rankings, or thousands of new visitors to your website request a free web design, search marketing, or advertising phone consultation now. Then check back each Wednesday, so you can beat the buzzer and save big from one of the future sales. thank you for this.. by the way, your layout is wonderful. What is 9 + 4 ?